After confirming earlier this month that it’ll sell the LG G7 ThinQ, T-Mobile today shared its launch and pricing details for the new Android flagship. The LG G7 ThinQ will be available from T-Mobile on June 1st. If you know that you want to make the G7 ThinQ your next daily driver, you’ll be able to pre-order starting this Friday, May 25th, at 5:00 am PT/8:00 am ET. Pricing for the LG G7 ThinQ will be set at $30 down and $30 per month for 24 months on an Equipment Installment Plan. The G7 ThinQ’s JUMP On Demand! price will be $0 down and $33 per month, while full retail pricing will be $750. 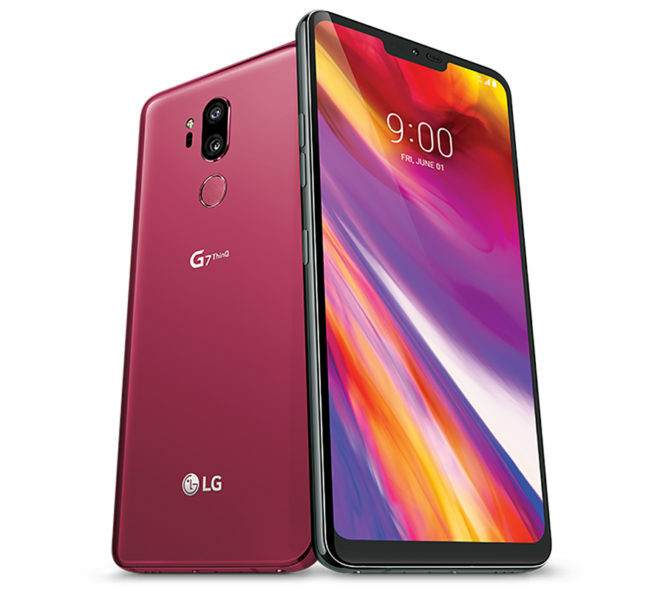 T-Mo will have a special LG G7 ThinQ deal available when pre-orders open on Friday. Customers who buy two LG G7 ThinQs on EIP can get the second one for free via 24 monthly bill credits. Also of note is that T-Mobile says that it’ll be the only carrier to offer the LG G7 ThinQ at Raspberry Rose. As a refresher, the LG G7 ThinQ runs Android 8.0 on a 6.1-inch 3120×1440 display. It’s got a dual rear camera setup with one 16MP f/1.6 camera and one wide angle 16MP f/1.9 aperture, a Snapdragon 845 processor, 4GB of RAM, 64GB of storage, and a microSD card slot. Rounding out the spec list is a 3.5mm headphone jack, a Snapdragon 845 processor, IP68 water and dust resistance, and a 3000mAh battery. The LG G7 ThinQ is also the newest phone that supports T-Mobile’s 600MHz LTE coverage as well as network features like 4×4 MIMO and 256 QAM. Isn’t V30 BOGO deal better??? $695 vs $750. Depends on whether you have $1,400 lying around to buy two devices straight out. The current V30 BOGO deal requires you to buy both devices straight out after which you receive a credit gift card for the cost of one of the devices where as this deal is done through EIP. EIP is better for most customers because it spreads the cost out. Also, it’s cheaper because the V30 has been out longer and the price has dropped. The V30 BOGO appears to be the exact same one as the G7. I was charged 168.95 and the rest will be on the EIP for 24 months. Huh? The V30 deal is bill credits… You are NOT buying both devices straight out. Does this BOGO require adding/porting a new line? There’s no mention of adding a line or porting in the fine print of the offer. valid with JoD or just EIP? If you’re referring to the BOGO deal, you must buy both phones on EIP. It says EIP and JoD is done through EIP. Still, some sales exclude JoD so you should check with a rep once the deal is active. Reps often don’t have access to the final terms until deals are active. If they say it’s valid but there’s any question of it not being then have the rep making the sale make a note on your account, this should help protect you if they say that it wasn’t actually valid later on. TMO should bring back the S9 BOGO deal. WAY over priced!! LG priced themselves out of the market. It’s making one choose between an S9 and the G7… the G7 will lose. I wanted this phone…will now seriously look at OnePlus 6. And now nor do i want do. The price will drop quickly, just like the G6 did. Lg G7 overseas’ model comes with earphone but US model doesn’t I don’t get it and still priced $750. They should’ve priced it $650 and the 6gb ram 128gb rom model $750. Do you mean earphone jack? All G7s come with an earphone jack. I know all LG G7 have headphone jack but I’m talking about actual earphones are included in the box in international model. Saw unboxing of I believe Korean model that comes with earphones and usb c adapters just like samsung galaxy phones that comes with AKG tuned earphones + otg adapter. Bye Bye LG… overpriced if only buying one. Don’t see much of an advantage over the v30. smaller battery, screen is not oled. I may opt for two v30 with no down payments required. Unless they are waiting later to do it. $750? You can get Honor 10 for $500. Does anyone trust LG these days to deliver a phone that doesn’t eventually bootloop? I’m still burned. I swore off LG when they came out with the G2X. Piece of crap phone! But then I was provided a V30 last November for work and this thing has been a very good smartphone. Just ordered 2 this morning. They have Rose and Silver available. I did not have to add a line to get the BoGo! They waived my shipping. I had to pay taxes and $30 down for each. it think it was just under $90 each. They tried to charge me for ~$20 shipping and $20 upgrade charge. But managed to get it waived. Did they give you 2 separate order number? Yeah, I did have 2 separate orders. Thought that was strange. Thanks… Thought that was strange too. They kept mentioning to go to some link to put in the promo code TM59 but there’s nothing to follow up on. Are we supposed to do something else? Were you able to put the both eip’s on the same line or was it 2 separate lines? Thinking about picking this up as a spare and my wife needs a new phone. Thanks! I did do 2 separate lines on the same account. One for me and one for my wife. I went ahead and ordered two V30s. bigger battery and oled screen. going from the galaxy s8+ should save about 35 dollars a month. It will be my first lg. Do you need to be on a T-mobile ONE account to qualify for this deal? I am not on ONE and they said I could get it. My G7 order was shipped last night and will be delivered today 05/31/18. Preordered it on may 25th 3pm EST was told by rep that it was on backorder and should receive it between June 1st to 4th. Ours also shipped last night. I placed my order early in the morning on the 25th though, they didn’t mention anything about backorders.